"Makes me want to reconsider Gearbox Publishing's current posture on the platform"
Borderlands 3 is the latest big-name game to be snapped up by the Epic Games Store as a timed PC exclusive, and many Steam users aren't happy about it. In protest, thousands of them have begun leaving negative reviews on existing Borderlands games on Steam in a textbook case of review bombing. 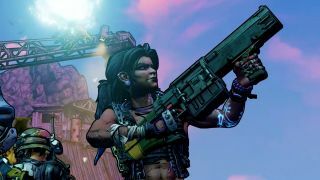 Gearbox CEO Randy Pitchford recently addressed this review bomb on Twitter, saying it actually "makes me kind of happy about 2K's decision" to make Borderlands 3 a timed Epic exclusive (it will come to other stores in April 2020). When Borderlands 3's timed Epic exclusivity was announced, Pitchford was quick to point out - presumably after being inundated with angry tweets - that "2K/Take Two has exclusive publishing rights for Borderlands 3 and makes all decisions regarding price-points, territories, distribution and platform partnerships." At the time, Pitchford seemed neutral on the whole deal, but following the review bomb, it seems his opinion of Steam has worsened. Notably, while Pitchford said Steam "has no interest in correcting this misuse," the actual scores of the review bombed Borderlands games were protected by Steam's new "off-topic" filter. The negative reviews are still there, but they don't factor into those games' review scores because they don't actually reflect or discuss the quality of those games. It's not a perfect solution, but it's at least something. Even Pitchford acknowledged that the argument of Valve totally ignoring review bombs - which it did for some time, for the record - is "admittedly hyperbolic," though he thinks "their solutions aren't great." Pitchford later added that he prefers Epic's curated storefront and incoming opt-in user review system to Steam's 'come one, come all' stance. "Why does a store even need a review system?" he said. "I like stores that do curation. As a customer, I strongly prefer curation over free-for-all. If I ran a store, I would only carry products I want to recommend, not let anyone put anything they want into my store." Relatedly, one user argued that review bombing is the only way for users to send a message to developers. Pitchford snapped at them and pointed to 2K's social media as a way to share feedback. Personally, I'm still a bit blindsided every time Steam users implode over an Epic exclusive. The Epic store is barebones and a bit of a pain to use, I understand, but it's not that bad. It's also free, meaning the intimidating paywall in front of console-exclusive games doesn't apply here. For comparison, I always remember that Destiny 2 PC is a Battle.net exclusive yet I still have all my hair. Then again, I've never been very good at Getting Angry Online. Epic CEO Tim Sweeney said the Epic Games Store is helping the games industry, even if gamers don't always see it that way.